"The exhibition consists of the light installation Lumen Balance, the series Breathe In Breathe Out, wherein paintings are combined with lamps, and the installation A Couch to Match the Painting. The concepts behind Stallinga’s works are often based on our awareness of the everyday world around us. This involves concepts like sense of time, sonorous and visual perception and experience of energy in the form of light, heat or movement. The observer is often left surprised or even optically deceived by Stallinga’s works in which everyday phenomena are presented in a different context. In his installation A Couch to Match the Painting, Stallinga offers another perspective on the clichéd idea of “the painting above the sofa”. In the installation both sofa and painting are stripped of their primary function. By showing the painting backwards and thus revealing the stretcher,and by hanging the canvas loose in space, Stallinga deconstructs the illusion of a two-dimensional painting into a pure three-dimensional object of wooden laths and a piece of cloth. The sofa in this installation is made of the same materials as the painting, the focus is also on the material structure. However, in this context it is the sofa that is elevated from practical object to sculpture. 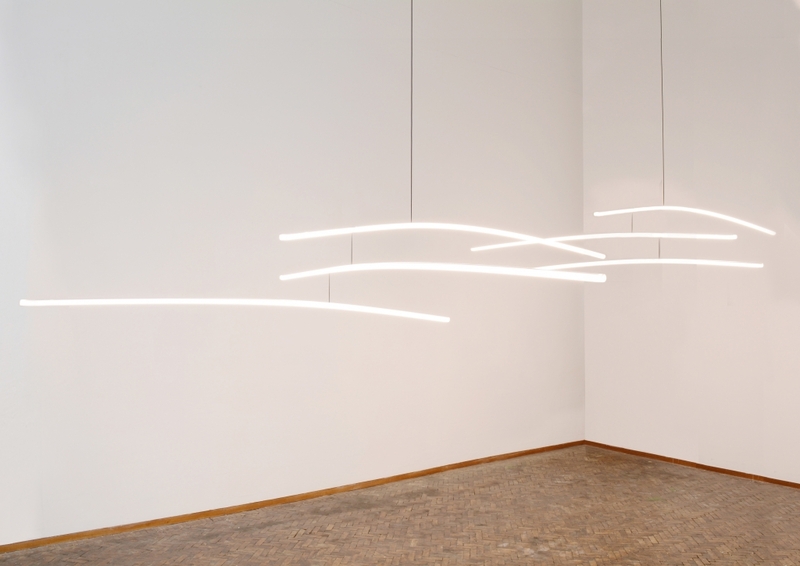 In the light installation Lumen Balance subltly bend light lines float in the gallery space as naturally moving mobiles. These lamp tubes create various hues of white light, in which we can recognise the hourly and seasonal changes in daylight. Stallinga plays with the perception of light by making the viewer aware of the influence that light has on our perception of time and our sense of warmth, simultaneously showing us light as an energy that moves. Light also plays an important role in the series Breathe In Breathe Out. Stallinga literally frames light by hanging circular lamp tubes that are strung together in front of a canvas. Like a painter he attempts to direct light and dark to achieve a visual illusion. By varying the light’s intensity or by partially covering the lamp tubes, forms and depth optically emerge. The subtle brightening and dimming of the light creates associations with the rhythm of our breathing. It is this visual game with physical and optical patterns, realised through ingenious programming and production that makes Stallinga’s work so intriguing."